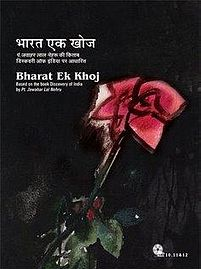 Episode #21 Of Bharat Ek Khoj – Hindi TV Serial On DVD is titled as Bhakti. As the title suggests the episode is devoted to the rise of various ways of believing in and following the superpower (or the God). The episode rightly mentions Shankaracharrya (who is known by the outer world as Adi Shankara) who lived in early 8th century CE. Shankaracharya Was good poet and social reformist (needless to say a philosopher and a very intelligent fellow who is clean at heart and have genuine thoughts about the betterment of humanity). Pt. Nehru praise his qualities and mentions Shankaracharya have clear thoughts about Gyan, Bhakti and the way of living. Shankaracharya has tried to unite the entire India in terms of Dharma (as the way of living, not mere religion). His idea about the self and the soul are quite logical and thoughtful. He relentlessly traveled throughout the Aryavart and (most importantly) arranged the meets where logical discussion about the way of living, various aspects of life and afterlife were discussed without any prejudices. His work is immensely valuable. The episode then moves ahead to explore various sampradayas (a specific group of people, branch of a society which believes in the same way of living and God and way to pray to him). The episode takes on many Sampradays including Kapalik, Jain, Boudh, Shaiva, Vaishnava, and others in quite a satirical manner. The tale of how a Kapalik with his lady aide was used to drink Madira (alcohol). They eventually they lost control over themselves. They used to have a very old pot which they used to keep food, drinks and other stuff they gain as Bhiksha and eat and drink from. On one day under the influence of Madira they lost it. At the same time, a fellow who believed in some other Sampradaya meets them. They suspect him as the thief of the pot. How the things move ahead is the explored in a quite funny manner. Actually, the above mentioned is a satire (Prahasan) written by a king who has his own beliefs and all. The things happened then after is better to explore while watching it. You need to watch this episode with open mind. It is not trying to tell that one Sampraday is better than the other. However the satirical take may not be for everyone, especially the orthodox or conservatives. Actually, the base of any Sampradaya is a noble thought or set of thoughts. Eventually, when it grows there are many people associate themselves with it. Then the tricky situations come. Some bad qualities or limitations of the followers of the Sampradays started making it weaker. It is started to be seen as the poor attributes of that particular Sampraday (rather than the followers). Also, when the Sampraday goes bigger, there comes a large amount of wealth to deal with, and the basic tendency of a human being is to consider the wealth he is the guardian of, as his own property. And it doesn’t end there, he then wants to pass it on to his generations. The “eligibility” factor loses against the “heir” factor, and there starts the “fall” of the Sampraday. The same theory applies to rulers, companies and all the other segments of the society as well. The episode is nicely written and executed. The simple yet effective dialogs are hard-hitting. The convey the message they needed to. Folk songs about divinity from various areas of India are collected and played authentically. The traditional music is played well. Rajesh Vivek Upadhyay, Mita Vashisht and Harish Patel played their roles very effectively. They are theatre actors and they can slip into any character very easily. Their versatility is explored nicely. While watching the episode, you cannot think of any other actor playing their roles. They are supported by some other nice performers. The sets are realistic and have minimal properties. The wardrobe is also quite simple and authentic. The locales are chosen wisely. The episode proves that if you have good content and great performers at your disposal, you can deliver a magnum opus with quite a low budget as well. The episode explores the “Bhakti” philosophy nicely. While it talks about how people of various areas of India have their own ways to believe in God, it also takes a satirical look at some of the wrong things got implanted into various Sampradayas. It is to be watched with an open mind. A really nice TV Serial episode which should not be missed.